The Boston Bruins didn't need overtime this time, and they didn't even need all four third-period goals to send the Toronto Maple Leafs home for the summer again. 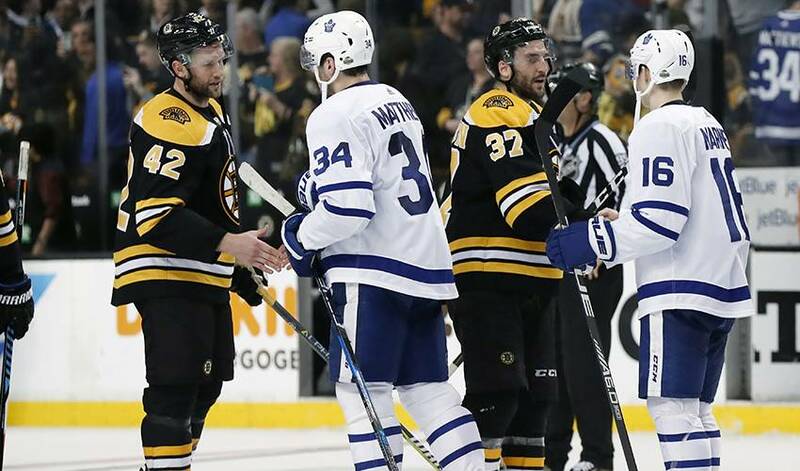 BOSTON — The Boston Bruins didn't need overtime this time, and they didn't even need all four third-period goals to send the Toronto Maple Leafs home for the summer again. Kasperi Kapanen put Toronto ahead 4-3 with a short-handed goal in the second. But Torey Krug tied it early in the third, and DeBrusk gave Boston the lead when he slid the puck through Frederik Andersen's legs right before being flattened by defenceman Jake Gardiner. Danton Heinen scored his first NHL post-season goal, Patrice Bergeron had a goal and two assists, and David Krejci had three assists for the Bruins. In his first NHL post-season series, DeBrusk had seven points in seven games. "Uh, it went pretty well," he said sheepishly. "Obviously, with the win it was special — something I'll never forget. I'll never forget this series just in general, first playoffs. I was really happy to contribute." Notes: Bruins coach Bruce Cassidy, in his first full season on the Boston bench, was named a finalist for the Jack Adams Award as the NHL's coach of the year. ... Celtics Hall of Famer Tommy Heinsohn was the honorary fan banner captain, getting the crowd riled up before the game. ... The Bruins are 14-12 in Game 7s and Toronto is 12-11. ... Boston's Kevan Miller had two assists for his first multi-point playoff game.... Travis Dermott also scored for the Maple Leafs. ... The Bruins scored two 4-on-4 goals after matching penalties opened up the ice.